Arash’s Kitchen is a restaurant in Kyoto offering Persian and Indian food just behind Heian Shrine, really close to Kumano Shrine. There are a few reasons why this restaurant stands out from others in Kyoto: the restaurant offers Halal food, which until recently was quite hard to find in Kyoto; the restaurant offers Persian cuisine, which you don’t often see around here. And most of all, the muscular proprietor of the restaurant, Mr. Arash, is a great guy. The atmosphere at the restaurant is warm but very different from most other restaurants in Kyoto. From the water pipes on display to the neon signs, everywhere you are reminded that this restaurant offers something other than kaiseki cuisine. And maybe because some people want to take a break from all that Japanese fine dining in Kyoto, this restaurant is especially popular among foreign patrons. This salad carries the name of the restaurant’s owner, and for a good reason. This is one of the nicest salad dishes in Kyoto. You have the juicy tandoori chicken on top of the salad, but you also have the olives and lemon sauce making the tanginess of the lemon work with the sweet, spicy, juicy chicken. You also get some excellent yogurt-based dressing with this salad. Everyone knows this dish, but it’s not often that you get falafels of this quality. Arash’s falafels are crisp on the outside, but soft inside. Just the way they should be. The falafels at Ikea are not going to cut it after you have had these chickpea-balls. Efes is a pilsner from Turkey. It has a light body, a light amber color, and a refreshing aftertaste. Meaning that it goes really well with the food served at Arash’s Kitchen: the beer doesn’t scream for attention, but rather complements the food. This beer works especially well with the juicy kebab; the beer makes the spicy meat just taste that much better. The restaurant is located on the second floor, but thanks to its bright neon lights it’s really easy to spot. They have belly dance on Saturday nights so be sure to check that out too! This restaurant offers something that Kyoto has lacked, and that is great kebabs and falafel with belly dancing. There are not many places in Kyoto that have such a laid-back atmosphere as Arash’s Kitchen, so when you just want to relax and enjoy some good food, this is the place to be. For me, the best part was Arash’s Special Salad. While living in Japan, you sometimes start to long for olives, and this salad answers that craving beautifully. 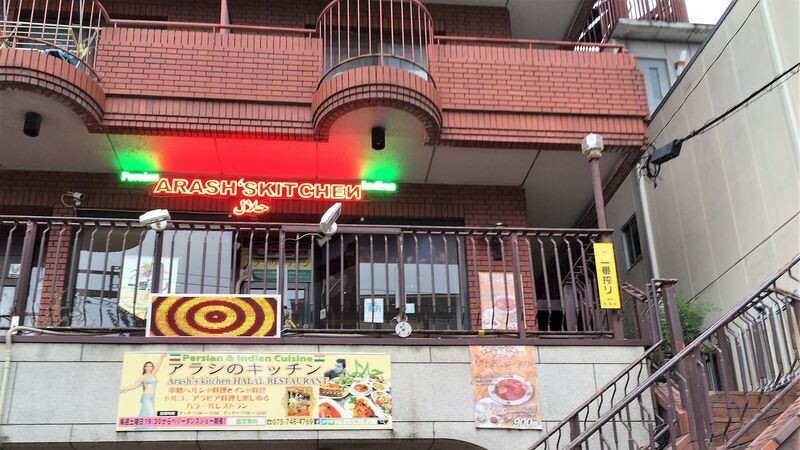 Arash's Kitchen is a 7-minute walk away from Keihan Jingu-Marutamachi Station. Lunch: 11 a.m.-3 p.m. Dinner: 5 p.m.-11 p.m. They have a belly dance show on Saturdays. Their menu is in English and you can even order in English. What else could you want in Kyoto?